Since this pregnancy, I've taken a rather uncanny - you might call it obsessive - interest in apples. I buy them by the bushel, which is silly when you consider that we're still only two of us (excluding the wee thing) and my fridge isn't even regulation-size. But it's true: I buy all of the apples, often seconds, still: there are never enough. I've been a Honeycrisp girl for the past couple years, but this fall, I think I overdid it. Now I've taken up with the Mutsus and the Jonagolds: they're crisp, sweet, and still plenty tart. I'm hooked. I hauled home a batch last Sunday without remembering the drawer full of apples in the fridge, an occurrence not uncommon for me these days. And if you're with me - and I'm thinking you are, because, well, you're here - you know that the most logical solution to this so-called problem is to spend a bit of time baking up a batch of apple-cheddar scones. Of course. The idea came to me before I walked in the front door, actually. Back in spring, my neighbor and I planted a slew of herbs out front. We've been pretty good about using the chives, thyme, and basil, but our poor sage plant has gone so underused that at this point, it's overflowing everywhere, practically begging to be picked. I plucked a few sprigs, mentally planning for Spaetzle with Sage Butter and Hazelnuts (a fantastic recipe, btw) and Mrs. Larkin's Butternut Sage Scones (another keeper). But then I remembered that a couple versions of apple-cheddar scones/biscuits had been lingering in my recipe file for a wee bit too long. It was time to give them a spin. Of course, I had to tinker. First, I was out of cream. Second, I'd picked up some beautiful rye flour at the market that I wanted to incorporate. Third, I didn't want to dirty the food processor or mixer, and I didn't see any reason why I'd need to. And fourth, I wanted little baby scones that I could freeze and bake off as needed. So it was that these little hybrids were born. They require no special equipment, and they come together fairly efficiently. All in all, they're a great addition to the breakfast/brunch repertoire. You know, for those days long in the future when I'll be preparing brunch again. Thanks to the addition of some rye flour, these scones have craggy tops and wholesome texture. If you don't have rye flour, whole wheat will work well, too. Same is true for the dairy: whole milk, half-and-half, and cream will all work well. I wouldn't put my money on skim, though. Preheat the oven to 375 degrees F and line two baking sheets with parchment paper. 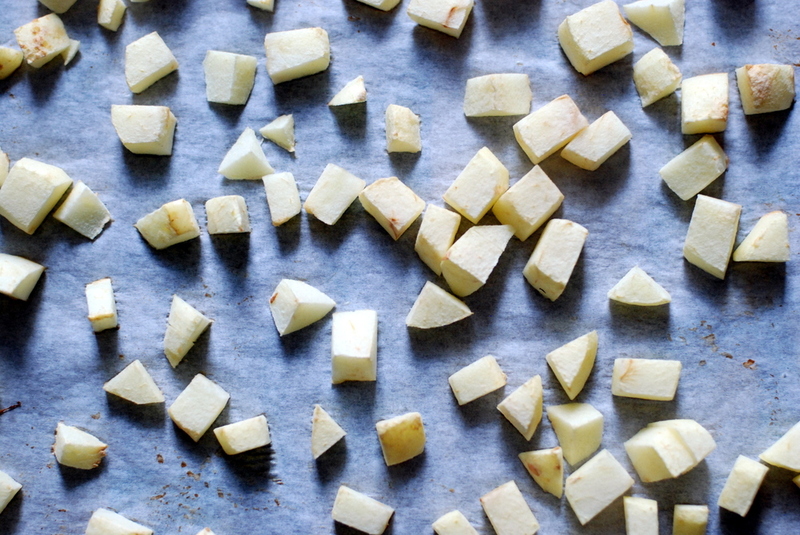 Spread apples on the lined baking sheet and bake for about 20 minutes, until dried out and about halfway baked. Cool completely (on a rack or, even faster, in the fridge). Leave oven on. In a large bowl, combine flours, sugar, baking powder, salt, pepper, and chopped sage. Toss with a fork to fully combine. Add cubed butter and use a fork, pastry blender, or your fingers to cut butter into flour until mixture forms pea-sized crumbs and no "dry" flour remains. Add cheese; stir to incorporate. In a small bowl, whisk together egg and milk. 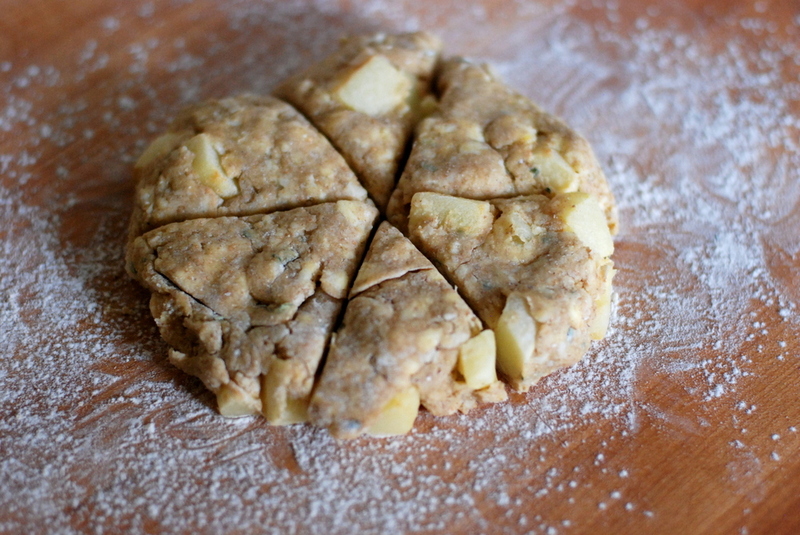 Add to dry ingredients along with baked, cooled apple chunks, and stir until dough comes together. Do not overmix. For large scones, dump dough out onto a floured surface, and gently collect dough into a large ball. Use your palms to pat dough into a disk one inch high, then slice into 6-8 wedges. Set scones on the parchment paper-lined sheet, leaving about one inch between scones. For smaller scones, halve dough, and assemble and cut each half as described above. You should end up with 12-16 smaller wedges. Set scones onto the baking sheet. Stick a small sage leaf face-up on the top of each scone. Brush tops with milk/cream. Bake 30 minutes for larger scones, 20-25 minutes for smaller scones, until cooked through and golden brown at the edges. Set on a rack to cool for at least 5 minutes; serve warm or at room temperature. These scones are best right out of the oven, and ideally eaten the day they're made. That said, they can be frozen unbrushed/unbaked on a lined cookie sheet; once fully frozen, transfer them to a freezer bag for storage. To bake, no need to thaw; just brush with milk/cream, and add 2 minutes or so to the baking time.